I am going to go into detail about cold processed soap trace. But first, I am over the moon excited about the release of my new book. So bear with me as you hear about it every which way coming and going over the next few weeks. It’s been months of very long hours and hard work and I am thrilled with the final product (Well worth all the hard work!). 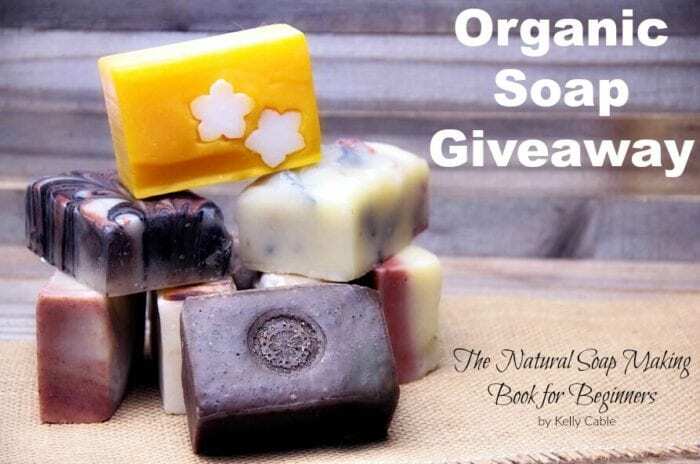 So, what better way to start things off then with a giveaway of 6 month supply’s worth of natural soap)? More on all that below. First, What is cold processed soap trace? They say a picture is worth a thousand words, so for all of you who are new to soapmaking, or who have thought about it but not taken the time to jump in and try it yet, I have some pictures that can explain that sometimes confusing idea of “trace” in cold processes soapmaking. When making cold processed soap, most of the ingredients are first divided into two parts: lye water and oils. When the lye water is added to the oils a chemical reaction begins to occur called saponification. This is, put simply, when the lye interacts with the oil, busting the molecules apart and reforming to make (drum roll please!) soap! After the saponification process is underway and the oils and lye are turning into soap, the mixture will get to a point where you can actually see the results of this interaction: trace. 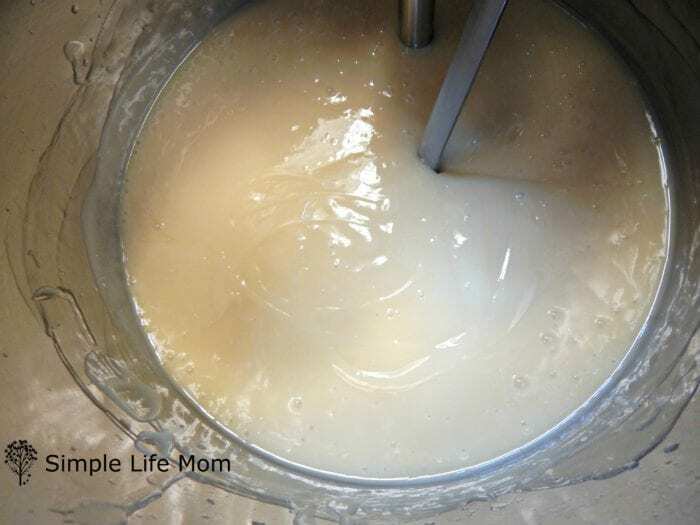 Soapers look for trace because it is a signal that the saponification process is far enough along, and emulsification (blending) between the oils and water is complete, and it is now safe to pour the soap mixture into a mold where it can finish the job all on its own. What Does Soap Trace Look Like? So, what does trace look like? 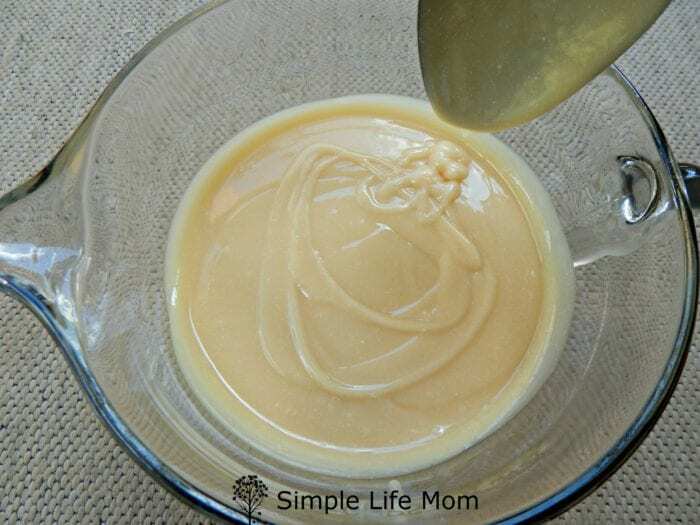 The mixture will appear thicker than before and will leave a trace or trail behind when a spoon drizzles a scoop of soap over the top of the mixture. Very light trace leaves a trail that is not raised, but barely visible. Often it is easy to see at an angle under a light. I have had Castile soap recipes that have not wanted to set up where that light trace indicator was a wonderful thing to see. Here is a picture of light trace. Sorry about the shadow. My mixture wanted to thicken very quickly and I had one shot at getting it. You can see the light trail that is not raised, but still leaves a visible trail through the soap. Basically, trace gets thicker as you continue on. Light trace is great for making swirls that sink down to the middle of the soap, and for giving you time to add herbs and other ingredients like coffee grounds or oats before it sets up. Medium trace gives you more options for suspending colors and herbs in the top layer of your soap without them lying above the soap (contour of top is still flat). You can see that it is nearing a more pudding consistency. Thick trace is a thick pudding consistency and great for layering colors within soap, because it is thick enough that they won’t sink and blend into one another. The other two things to watch out for is false trace and seizing. False trace occurs when oils begin to cool and thicken too quickly, making it appear that you’ve reached light trace, but really the mixture is simply too cold. 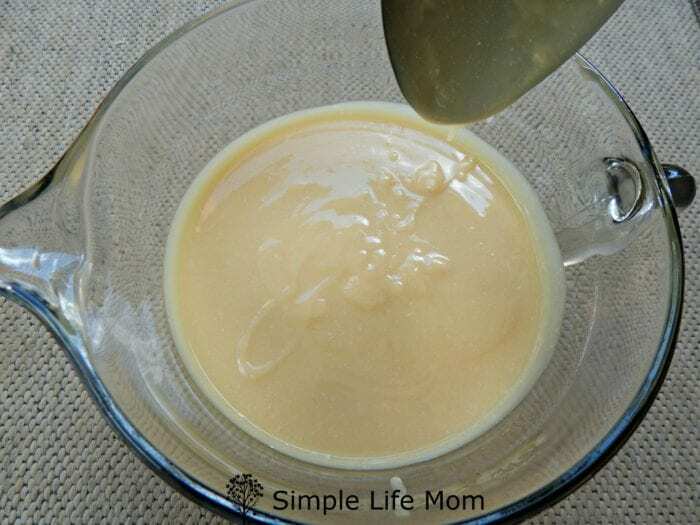 If you pour at this stage then most likely your water and oil are not fully emulsified and you’ll have pools within the soap and have to rebatch. Seizing can occur if your recipe has a lot of hard fats and you blend when they are at high temperatures. Seizing is beyond thick trace. 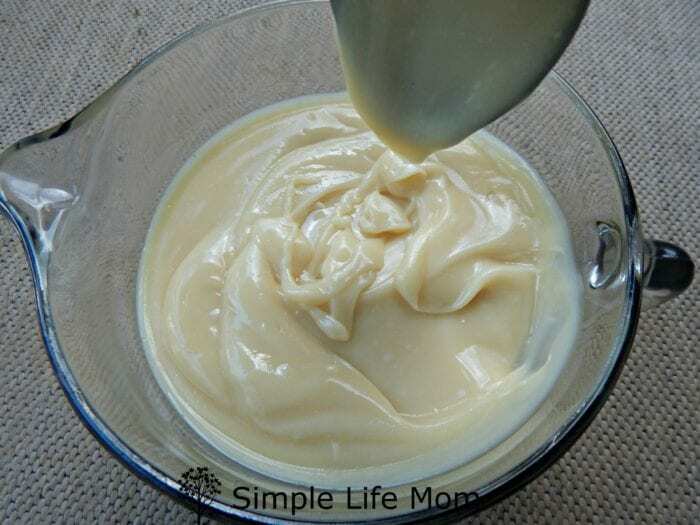 It is too hard too scoop and is very rare when using all natural ingredients.. Usually, even if it sets up faster than you anticipated, you still have time to scoop the mixture into a mold. I’ve only heard those who have used fragrance oils and fake colorings have issues with true seizing. I am so excited to FINALLY share all the great details with you! Detailed instructions and options for using herbs, essential oils, exfoliants, and more. Can you see why I’m so excited? You can Get the Book HERE. 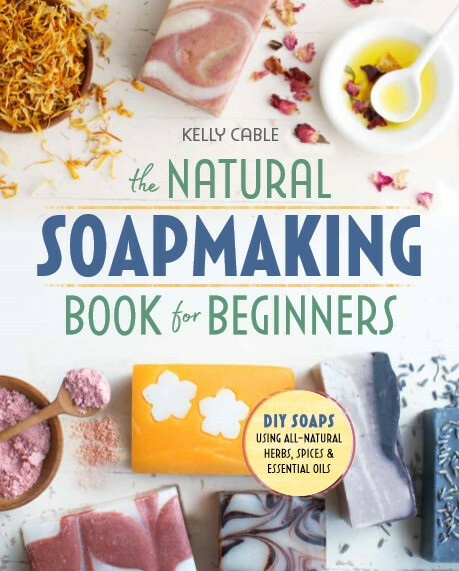 The Natural Soapmaking Book for Beginners is now available on Amazon for Pre-Ordering (Click Here to check it out). 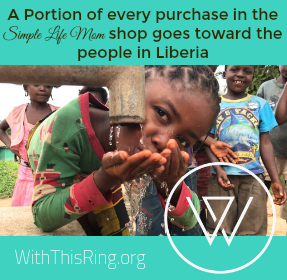 Please enter the giveaway and share, share, share! Thank you so much for your support. Looking to see some good basic advice with clear pictures, like in this post. Explanation of each trace stage and how it’s useful for additives/additions. Also hoping to find some basic recipes that use only oils commonly found in supermarkets, as well as ideas on sourcing lye, which isn’t as easy as it was 15 years ago when I was making soap. I definitely got you covered. I buy lye at my local hardware store or online, but yrs it’s harder to find or crystals now. They often have additives so you have to be careful.. I am going to get the book as soon as I can! I am very new to soapmaking and I would love to know more about the art of soapmaking! I have a trouble shooting chart and go over eveything in detail so you’ll know exactly what you need and why. I am excited to try some of your recipes because I have tried others from your post that I love. Thanks for all your great ideas! Aw, thank you Jen. I’m so glad you’ve enjoyed the other recipes as well! Congratulations on your new book! Thank you for detailing the soap making process. I have always wanted to try making soap but I’ve been afraid of the process. Your posts are always encouraging. Thanks so much. I really enjoy your blog and your Etsy store! Soap can almost always be fixed so there’s not a big risk in making it. And herbal soap can be so soothing, as well as provide some needed aromatherapy ?So go for it! Thanks for the encouragement! I try to provide the right tools to make it easier for others to get going with everything natural. I love your soap! I saw yesterday you had a new one I really would like but since I just recently bought 3 lbs. I am just hoping the next time I order it will be there. I’ve never made soap and always thought to leave this to others. But, just reading this one article makes me want to try. For some reason, those pictures just open up the creative processes. This looks great. I hope i win! Go for it! You’ll defintiely have everything you need at your finger tips. Hey, I always say, if you can learn how to bake a cake then you can make soap ? Thank you Missy 🙂 I hope you enjoy it. about soap making and techniques. Thank you so much. With over 55 recipes and other ideas I hope you find it to be a great resource. I am so looking forward to your new book in August near my 51 birthday! Can’t wait to get it! I LOVE your products especially your soaps! I have a question: when using your shampoo soaps, do you use the cider vinegar rinse every shampoo? Just wondering! Thank you! You are so sweet! I do use an acv/water spray each time I use the shampoo bars to condition and balance ph. It makes your hair silky smooth. Exited to learn the process – overall including the safety information! Great! Yes, I go into detail about safety. There’s nothing to fear, but there are certain things that you definitely should do for safety when handling lye. I have “thought about” making soap for years, and even purchased some of the items needed to do it. However, I’m still a bit timid about actually DOING it!!! Maybe this book, which looks to be a great one on how to, step by step, make soap with confidence will help ME gain the confidence I need to actually take it that one step further and actually MAKE soap!! I hope so!!! Thanks for the helpful push and the opportunity to win something, too. Best Luck on your book! This book looks like it might be a great addition to my library. I must confess that I haven’t actually made soap before but I’ve been thinking about it for a long time now so I’m looking forward to see what recipes are offered! Thank you! I never would have started making soap either of it weren’t for skin issues and then wanting to be in control of ingredients. Now I love it! I want to hopefully get some tips and guidance for making soap at home. I’ve tried the basics and want to refine my skills. My book starts with all the basics, but works up to more complicated methods and ingredients. I think the clear instructions make it easy for those who have worked through the first half of the book. I love your soaps! I hope to learn how it is done, your soap makes my skin feel good and I know the ingredients are so much safer than what you can buy in the stores. I am a little nervous about trying to make any myself. I’m so glad that you love my soaps! You could defintiely make your own if you gave it a shot. My book has all the details, plus the bonus collection has videos to get you on your way. I REALLY appreciate that you give recipes so that other woman can excel at being home makers. I am in the process of replacing everything ‘chemical’ in our house as we run out of it. Its a little over whelming but doing it one thing at a time has been doable and I’m not going nuts trying to do it all at once which I am prone to do! The next thing that is getting ready to run out is shampoo, so I’m on the search for that. Thank you for the chance to win soap. I hope sales go well for you. I will be one purchasing it. Tried to make soap once before and decided it wasn’t for me. But the desire has never left me and trying anything just once usually is not a good gauge to make a decision with. I will also concentrate on making small batches so I can experiment with different scents and not have a bunch soap I don’t care for. Thanks again! That’s right. You can always almost fix soap to make it usable, so no harm done. You sound like me with cheese. I didn’t have a good first experience and it took a while for me to try again. Congratulations on switching to all natural!! Don’t give up! Hi. Thank you for your informative blog posts. I’ve made soap on occasion throughout the years, but not regularly. Now my youngest daughter (15 yo) is interested do your blog is a great one for teaching her. 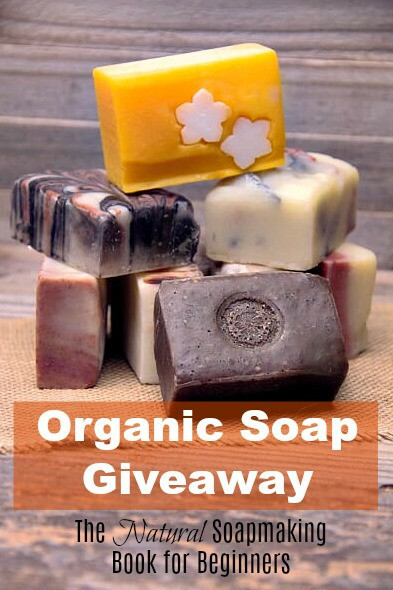 I’d also love to win your soap! They look lovely! Thank you Kim. I’ve had a number of moms tell me the same thing about their daughters around that age. It’s a great time to learn new things. My book has a huge variety. I’m sure you’ll find all the ideas that you need ? I know absolutely NOTHING about soap-making, and haven;t even used homemade soap (well, maybe at Grandma’s when I was a child), so I need all the basics! Then we got ya covered ? Hi Kelly! Love your site and all the great information! I just purchased your book as I’m getting back into soap making.. did it years ago.. but been on a soap hiatus..lol! 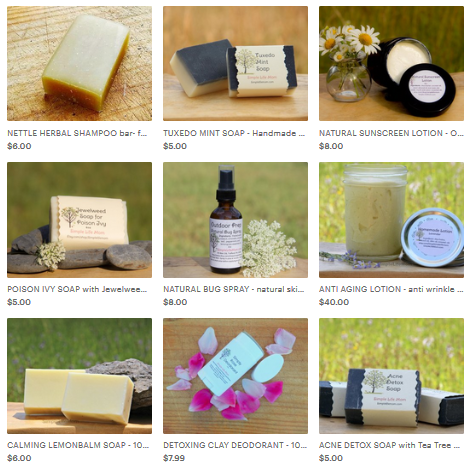 I have a small biz and do more making of all natural skin care products. With that said I just made your allergy relief bar from the book! Process went great.. it’s on week 2 of curing. Sorry for the long post, but was wondering if you could help shed some light on your lye discounts and amount of water calculations. I’ve run the recipe through various soap calcs and done it manually but just not get the numbers right. I’m sure I’m missing something… I’m nerdy like that in trying to figure out numbers. Your insight and help would be so greatly appreciated! Thanks for an awesome book.. going to be soaping this weekend! The SAP value of oils is the amount of lye that it takes to convert oil into soap. Most soap calculators will vary in what they believe is the SAP value for each oil, which contributes to slight differences in what is suggested for lye amounts. There shouldn’t be drastic differences or the recipe may have a typo error. Other differences come from settings, like water settings at 38% or 35%, or fragrance percentage settings differences.